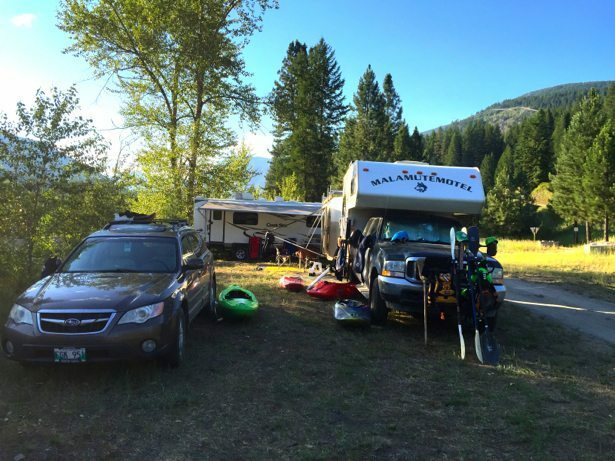 When we started looking at the calendar and trying to put together the pieces of the summer plan, one of our goals was to hit the Kootenay Paddling Festival in Crescent Valley, hosted by the amazing Chris and Andrea Ryman of Endless Adventures. 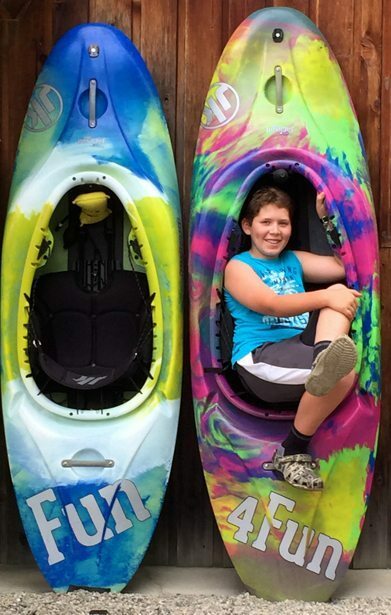 It seemed like the perfect fit for our first festival experience – a fun, laid back group of people coupled with great class III paddling options and somewhere that feels really safe for Hunter to spread his wings. play boating workshop – who brought all these people? 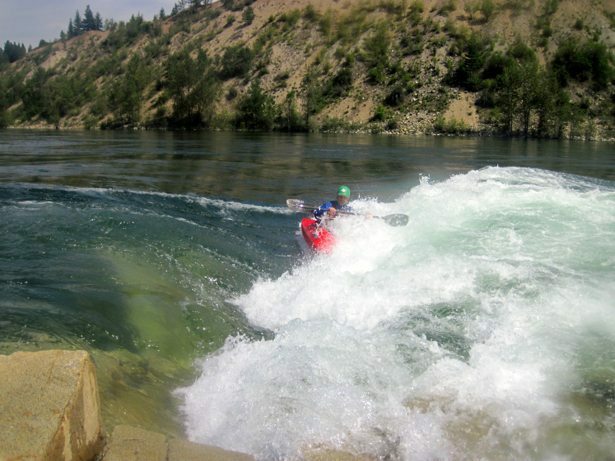 It was a weekend of extremes – lower than usual water levels (end of June water levels that looked more like early August levels) and temperatures over 40c each day. Shade was at a premium and we spent as much time in, on and under the water as possible. We rolled into Crescent Valley on Wednesday in time to catch the club paddle that night and never really stopped paddling until we left the next Tuesday morning. 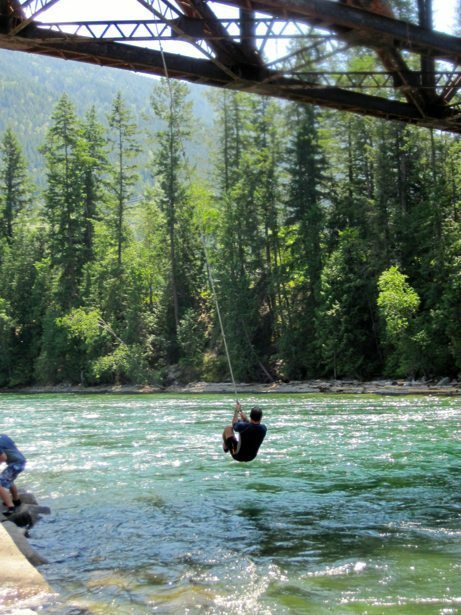 Many runs on the lower Slocan River with Hunter being able to comfortably navigate his own way down by day two, so he was then allowed to head off with various groups (other than his parents) which pleased him a lot. 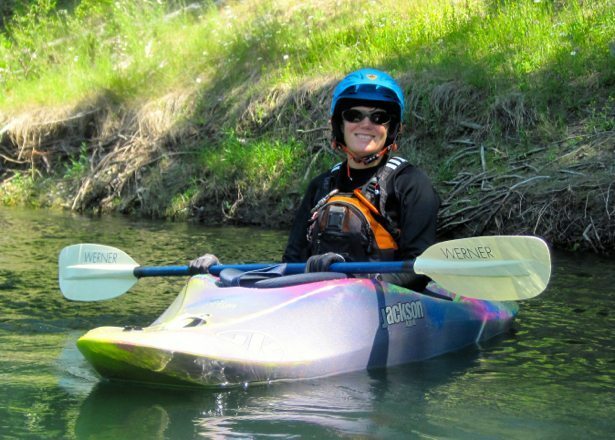 A fun day spent on Wilson Creek and all paddling made better by doing it with friends, new and old. We even got in a float on the middle Slocan where Hunter got to SUP down half and then row an oar rig raft down the last half – junior guide in training! 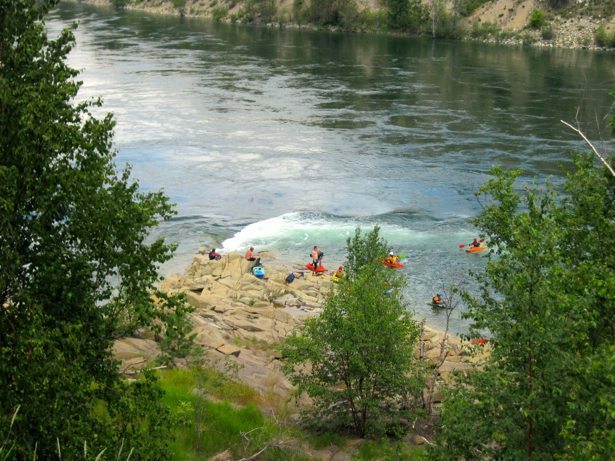 The campground and shop are located right across the road from the lower Slocan River put-in, which is also a family friendly beach area for swimming in the river. Gas station, grocery store and restaurants are all within 2 blocks so there is no real need to travel far. The local rail trail for biking and walking runs right beside the campground so there are options if you don’t feel like paddling. As always, Hunter found his place in the community. He quickly became a shop helper and was moving boats, blowing up inner tubes and even helping customers. He just loves being part of something! He is looking forward to heading back in August for 2-3 weeks and splitting his time between the river and the shop. 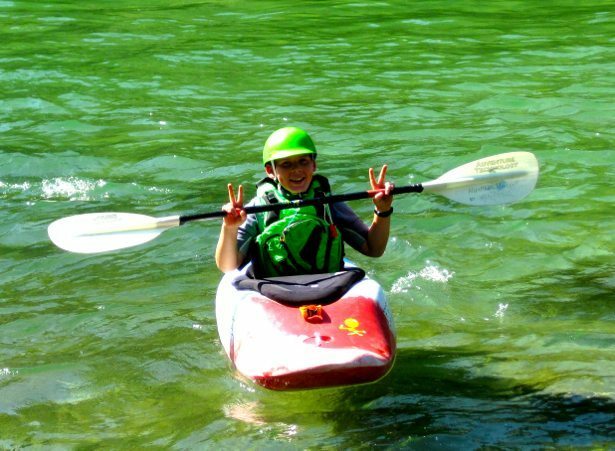 We definitely recommend the Kootenay Paddle Festival to anyone looking for a fun, family oriented opportunity to learn to paddle, improve their paddling skills or challenge yourself to stretch to the next level. It was never a question in our mind that we would hit Burns Lake again on our way south. 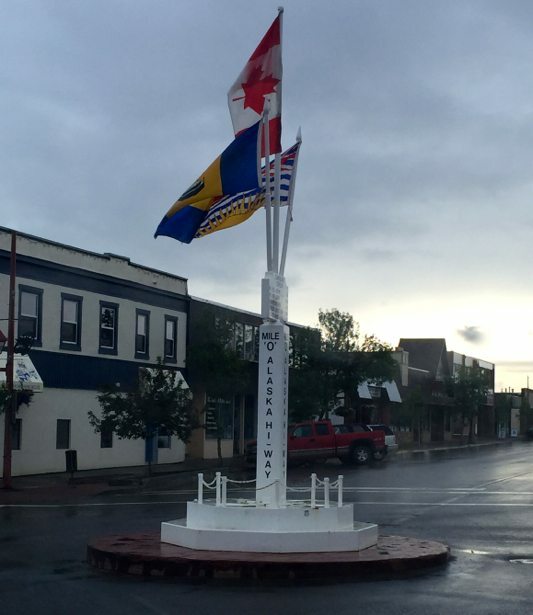 It didn’t even matter that we were going 2 hours out of our way based on our decision to come all the way down the Alaska Highway vs the Stewart-Cassiar Highway. It’s always tough to return to somewhere that you had an amazing experience. 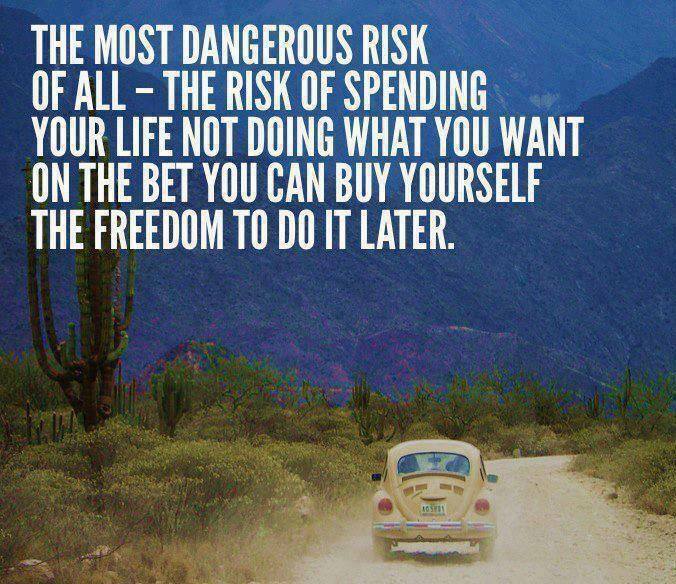 What are the chances that you can replicate it or will you just find disappointment? 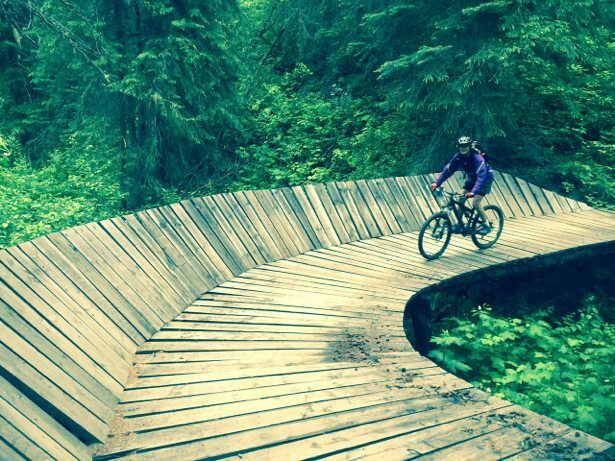 When we stopped there in the fall of 2013 we equally loved the trails and the biking community, lead by BLMBA and Burnt Bikes. There is literally something for everyone – beginner to advanced and you can stay amused for days. Rustic campground facilities on site make this such a simple choice. 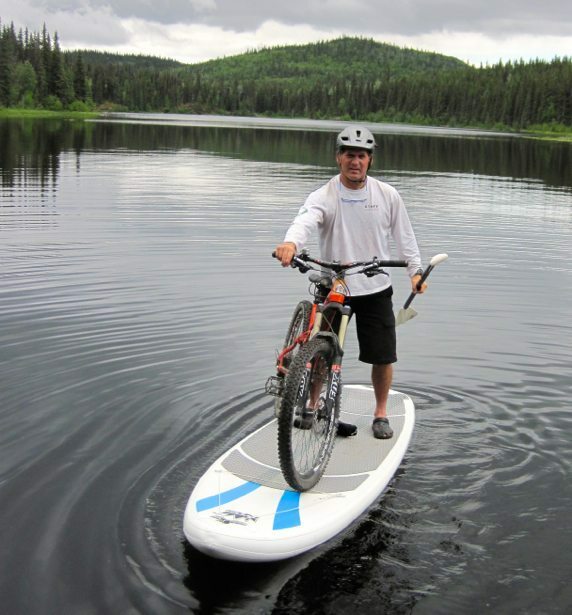 With a lake right at the base of the trail network, and right beside the campground, it can be a tough decision what to do each day… bike the amazing trails, walk the boardwalk around the lake or set out on the SUP or in a canoe for a peaceful paddle. While we were a bit set back by the rain, bugs and the cool temperatures, the trails and the community did not disappoint. Our first afternoon Pat and Susan just happened to be driving the shuttle van up the mountain just as we were set to head up – WOO HOO!!! Pigs Fly on fresh legs – what a way to start our riding here! Hunter had such an amazing run that he actually wanted to ride back UP (never heard of before) to ride again. It was a bit gruelling due to the fact that you are riding up a mountain, even if it is a fire road, and the bugs that come before dusk. The ride down was still fun. On Saturday we made the most of the weekend shuttles – an affordable $4 per person per ride up thanks to Burnt Bikes- and got in four runs, with only one variation off of Pigs Fly as it is Hunter’s favourite. It’s perfect for kids of all ages as it’s like a vertical pump track – incredibly flowy and you can get as much or as little air as you like. On Sunday we sent Tim off for a Father’s Day ride with the local club (a good 20+km ride on their epic trail) while Hunter and I did yet another Pigs Fly run with some other local kids in the campground. Smiles all around and fingers crossed that the snow will be melted when we head back up the highway so we can catch this on our way home again. 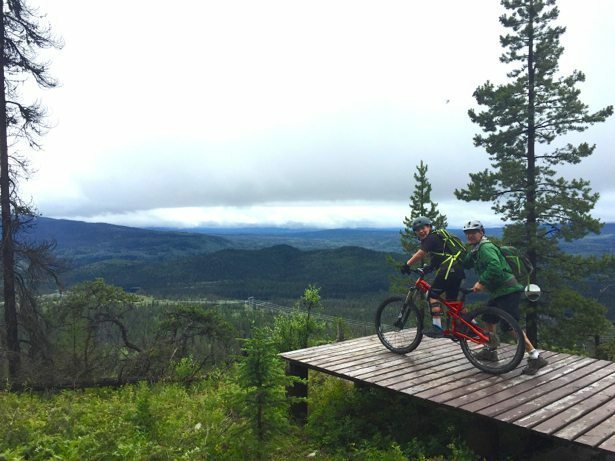 The local group continues to do trail development and we can’t wait to see what new trails they add to the system over the summer. 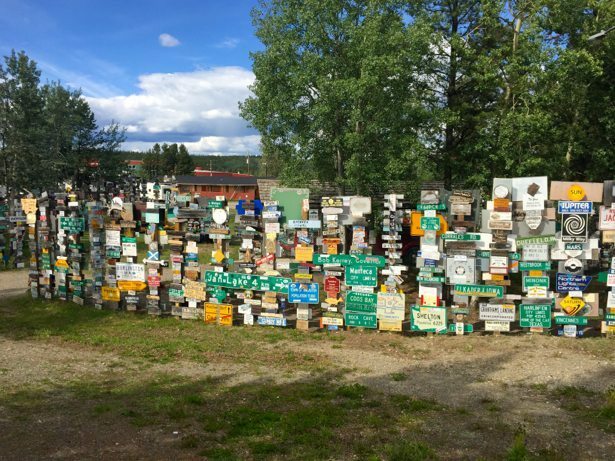 Our first pause to stretch was the Watson Lake Sign Forest in the southern Yukon along the Alaska Highway. We usually hit this every time we come north or south as it’s a great place to take a break and about 5 hours from Whitehorse. One of these days we will actually put up our own sign. 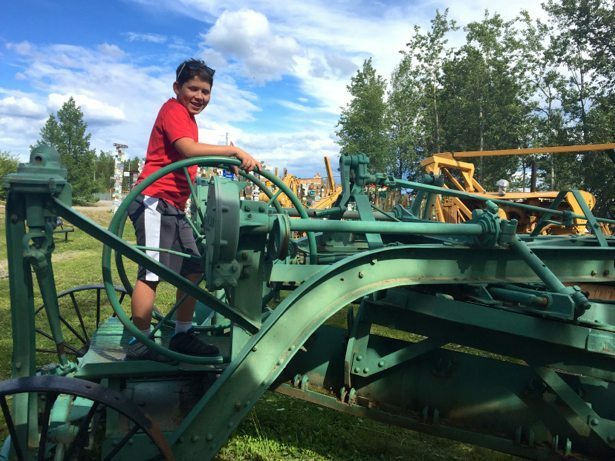 Kids have a great time checking out the old machines and old and young can enjoy the wide variety of signs throughout the forest (over 72,000 of them!). We managed to see lots of wildlife over the two days (bears, moose, elk, foxes etc.) but the Bison herd was definitely the biggest hit, with Hunter leaning out the window trying to get pictures while telling Tim to slow down. 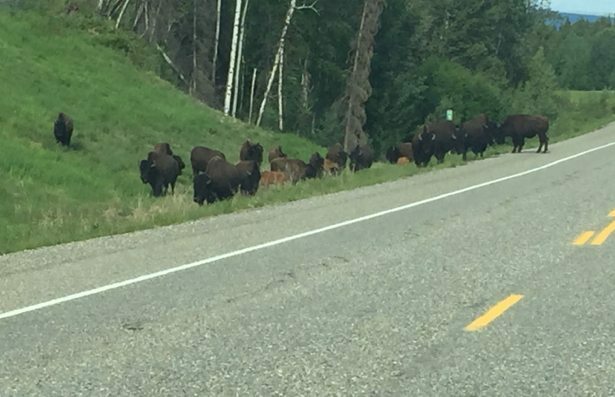 Stopping is a moment by moment decision based on which way the big males are facing and gauging their mood… The majority of them cluster north and south of Liard Hotsprings – another must stop destination on the drive north or south! 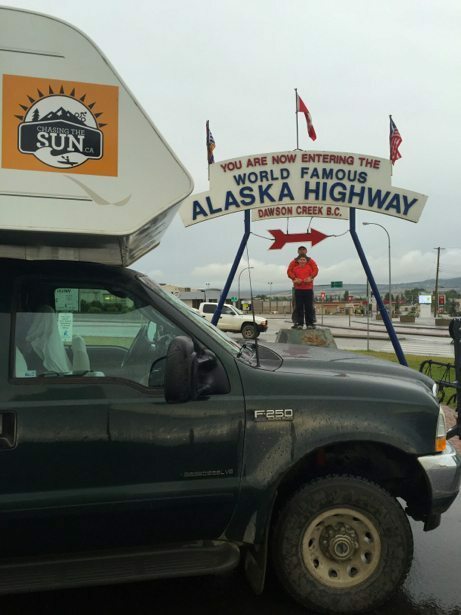 This year we drove the extra distance to reach Mile Zero of the Alaska Highway at Hunter’s request. He did most of our trip planning for the first two weeks as part of his last school assignment and found key things he wanted to experience while also calculating mileage, fuel costs and travel distance each day. Night two found us parked in an empty parking lot in downtown Chetwynd, home of a large annual international chainsaw carving competition. 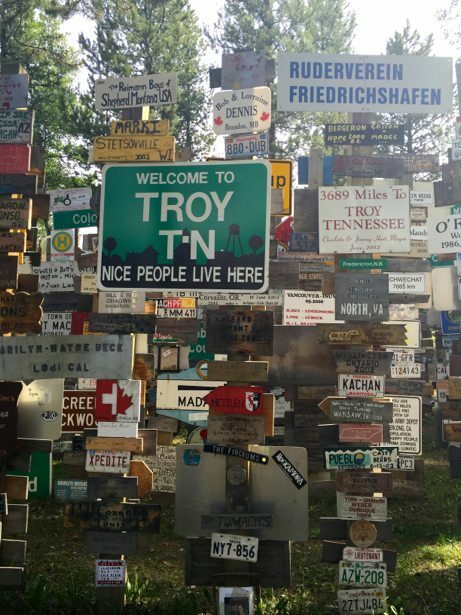 The best part is that all of the carvers work is displayed throughout town so it makes for a wonderful scenic walk through what would otherwise be a pretty standard northern forestry town along the highway. 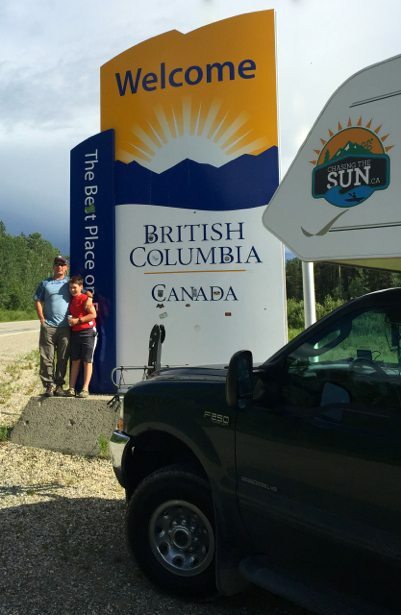 Night three and we made it to Prince George – land of cell service, grocery stores and other amenities. 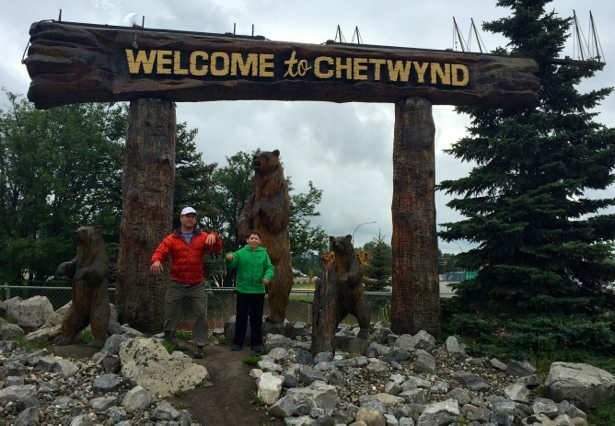 A great place to stock up before we continued west to Burns Lake for five days of Mountain Biking. 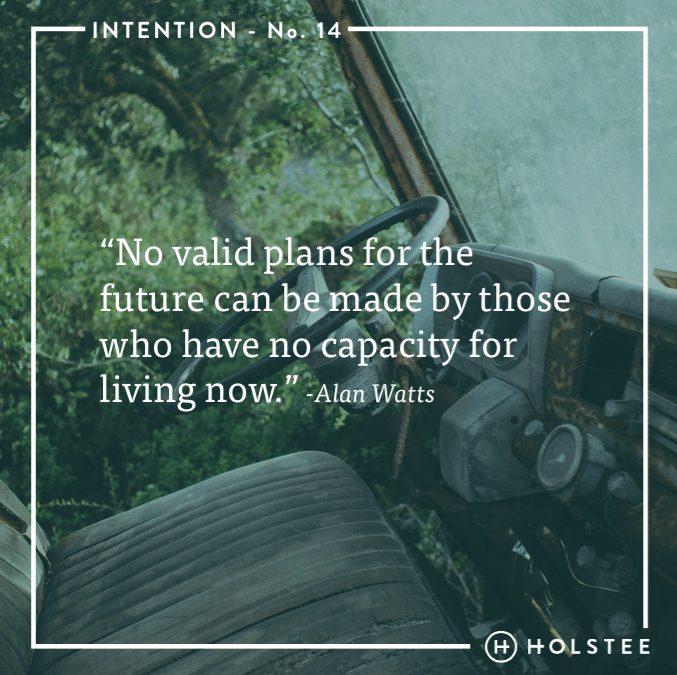 We are back on the road again – for eleven months this time… it came about for many reasons, some simple and some complicated, but no matter how we got here – it is great to be wandering again! It has been a whirlwind the last few weeks and as we get consistent wifi there will be a flow of posts coming. There will also be a new feature this year – Hunter’s Skateboard Park Reviews, a great project that matches his passion with some school learning opportunities. We are enjoying a down weekend in Canmore after burning out on non-stop mountain biking, whitewater kayaking and visiting with family and friends. Next stop is Revelstoke for more paddling and mountain biking and then off to Chilliwack for the Slalom and Downriver Whitewater Nationals.